CureTape ® has the TÜV Mark! A patient or a sportsman only wants one thing: the best medical care with the best materials. As nowadays a large number of (Chinese) imitation products are offered, we believe it is important in the interest of patients and sportsmen to ‘’separate the wheat from the chaff’’. 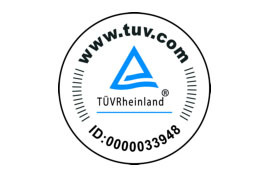 In order to prove that CureTape meets the highest quality standards we asked TÜV Rheinland to test our product. TÜV Rheinland is one of the most important international (technical) service providers for quality and safety. The conclusion of TÜV Rheinland: CureTape is a safe, latex-free product that meets the highest quality standards.